Your hardscapes aren’t just the foundation of your property - they lay the foundation of your curb appeal, too. Superior Pressure Washing delivers commercial concrete cleaning that gets your exterior on track for success. Concrete space has a way of sneaking up on a property. It takes up a significant portion of your surface area, and its maintenance matters. Your hardscapes are constantly under attack from the elements. And when you add the impact of foot and vehicle traffic, it doesn’t come as a surprise that these surfaces get so worn down. With the expertise of our professional technicians and our hot water pressure washing system, your concrete surfaces won’t just look clean -- they’ll look like new again. We take your property seriously. That’s why our hot water pressure washing represents the best technology in the industry. When you’re a Superior Pressure Washing client, you can always expect superior results. Because we don’t settle for anything less. With our team tending to your property, you get the best quality. Your hardscapes are the point of arrival for anyone who visits your property. They’re also the last thing that people see when leaving your space - and so it’s important to start and end the experience on the right foot. Slip-and-fall accidents are the leading cause of emergency room visits every single year. We remove the buildup that contributes to these accidents - and protect you, your employees, and your guests. When you regularly schedule concrete cleaning, you give your hardscapes the deep-penetrating clean they need to last longer. Our team removes corrosive buildup and protects your hardscapes from long-term damage. All of our cleaners are environmentally friendly. This ensures that your property is EPA compliant throughout our cleaning process. Your hardscapes lay the groundwork for your property’s first impression. We make sure that the representation guests get is professional and inviting. We always schedule our service around your schedule This ensures that you’re getting superior results that don’t disrupt your operations. 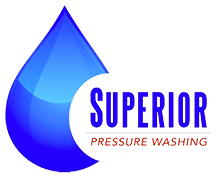 When you get commercial concrete cleaning from Superior Pressure Washing, you’re getting a complete solution for your property. Invest in the best - and let us bring a one-stop-shop hot water pressure washing service to you! Your curb appeal will thank you.